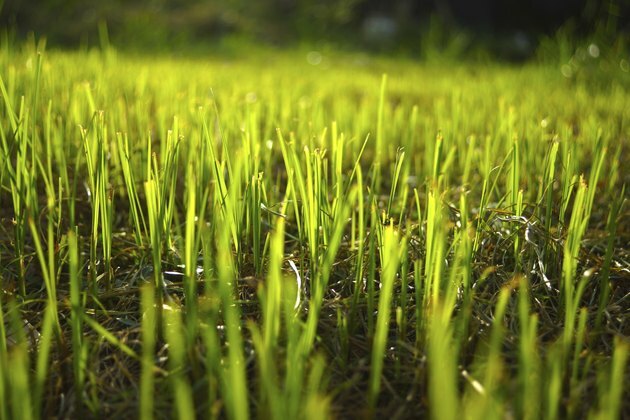 Identifying the type of grass in your lawn helps you mow, fertilize and water correctly. The leaf blades provide the most visible clue for accurate identification, although you may need a magnifying glass for a thorough inspection. Grass blades shoot forth from tubular sheaths near the crown of the plant, which emerges from the root rhizomes or stolons. When identifying a grass blade type, select several samples of mature grass blades for study. The main leaf blade emerges from the narrower sheath, which is located just above soil level. When checking blade size, make sure you are viewing the actual leaf and not the base sheath. Leaf size varies from narrow and thin to large and flat, depending on the species. Warm-season Bermuda grass (Cynodon dactylon), hardy in U.S. Department of Agriculture plant hardiness zones 7 through 10, features thin, 1/8-inch-wide blades. Perennial ryegrass (Lolium perenne), also hardy in USDA zones 7 through 10, produces much narrower leaf blades, usually no more than 1/16 inch in width. The shape of the leaf provides another identifying feature, although some shape aberrations can occur throughout the lawn. Check several leaf blades to verify the most consistent shape. 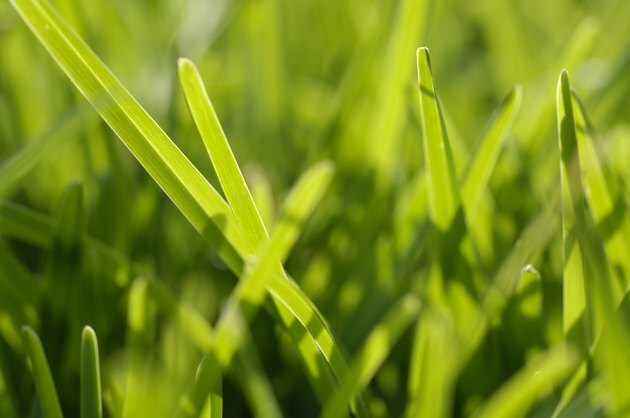 Most grass varieties feature varying types of flat leaf blades. For example, ryegrass blades have a midrib running up the center of each leaf, which gives the leaf a slightly bowed appearance, while tall fescue leaves (Festuca arundinacea), hardy in USDA zones 4 through 7, are flatter with no midrib. Leaves may emerge from the sheath slightly rolled, so flatten the leaf before examining its shape so you can better locate midribs, if they are present. 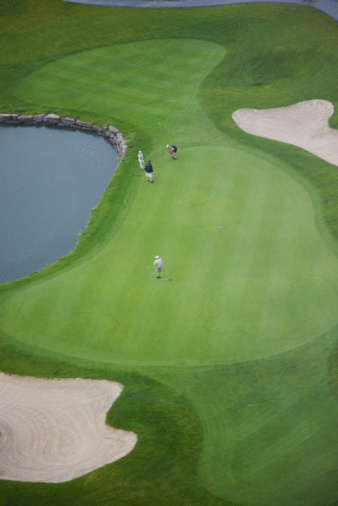 A variety of factors can alter the texture of a grass blade. 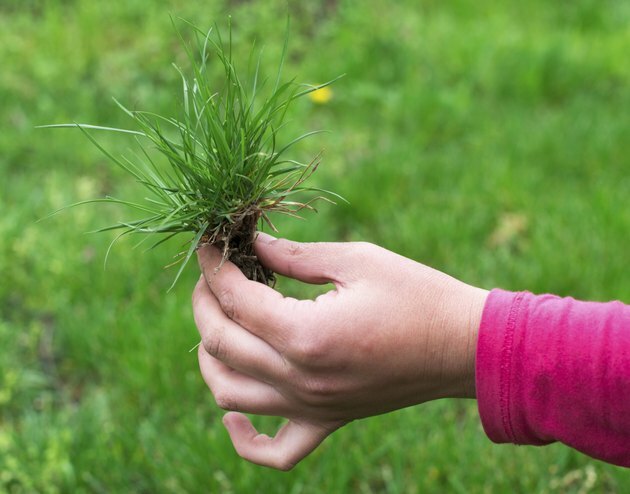 Tall fescue has hook-like hairs along the leaf surface, which you can both see and feel. It also has vertical raised veins running down the entire leaf surface. 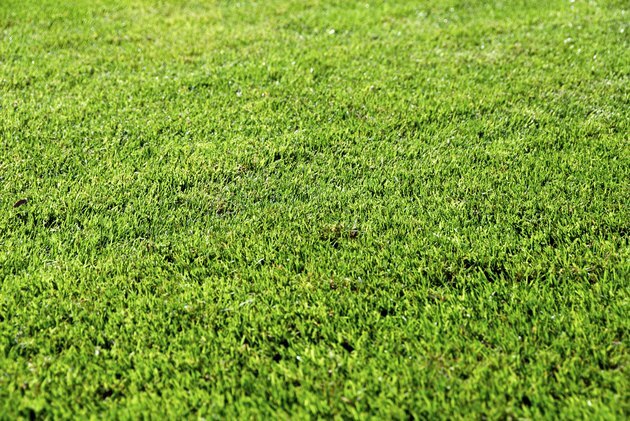 Perennial ryegrass has several raised ribs running along the vertical length of the grass blade on the front surface, but the back surface is smooth and almost shiny. Zoysiagrass (Zoysia japonica), hardy in USDA zones 5 through 10, has hairs growing on the ligule, which is the almost-clear membrane visible where the leaf emerges from the lower sheath. Some grasses have other features that make their leaf blades distinctive from other grass varieties. Bermuda grass leaf blades emerge from a central shoot at 1/4-inch intervals. Zoysiagrass leaf blades also emerge from a central stalk, but they grow at nearly a right angle to the stalk. The dull green leaves of St. Augustine (Stenotaphrum secundatum), hardy in USDA zones 8 through 10, lay almost flat on the ground as they emerge from the central crown. 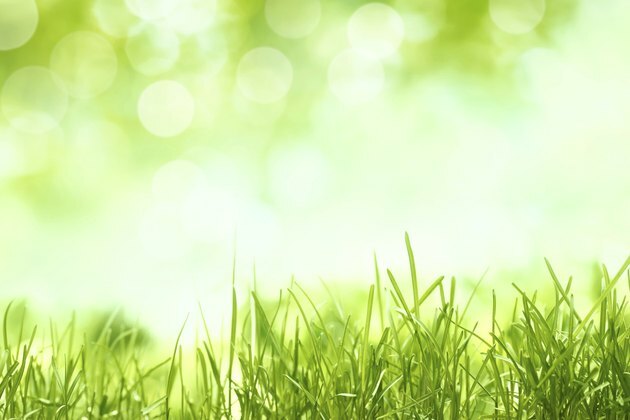 Kentucky bluegrass (Poa protensis), which grows in USDA zones 3 through 7, features a bright green color that sets it apart from other grass varieties.